Images expand with a click; blue text leads to additional information with a click. Easy to access – but easy to miss! 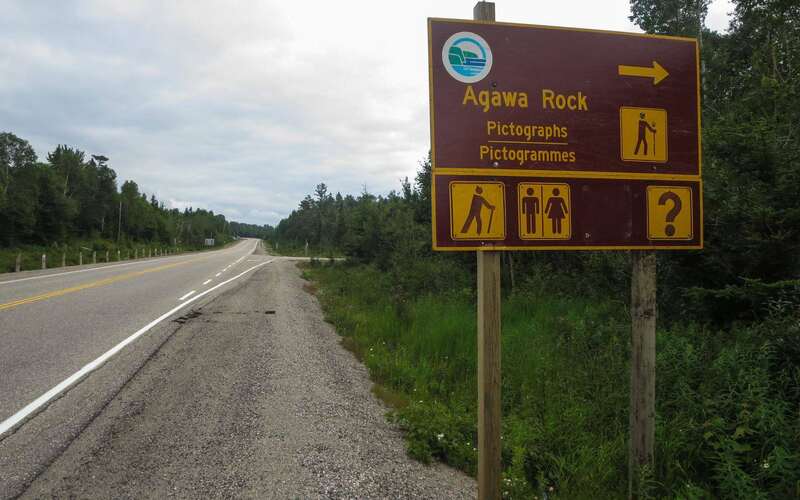 As you’re driving along the Trans-Canada Highway (Hwy 17), either 80 kilometres from Wawa heading south or 150 kilometres north from Sault Saint Marie, you will pass by a sign indicating that the turn-off for Agawa Rock is coming up soon. 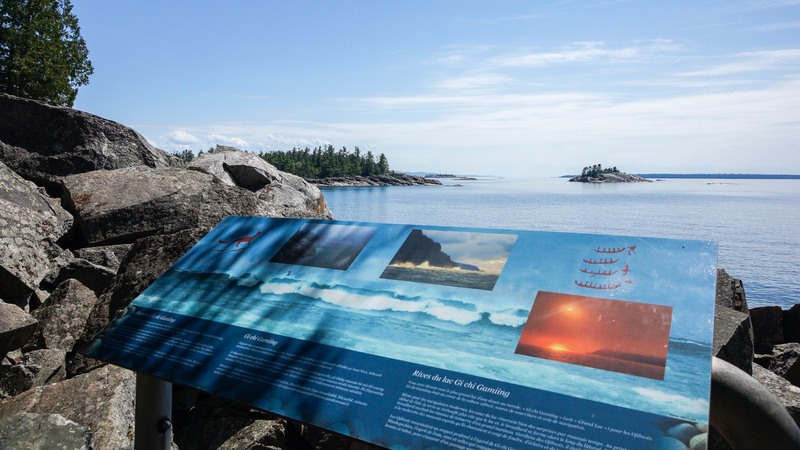 The sign will probably not even register with most travellers, unaware that they are passing by one of Canada’s most significant pictograph sites where rock paintings made by Anishinaabe shamans two or three hundred years ago can still be seen. 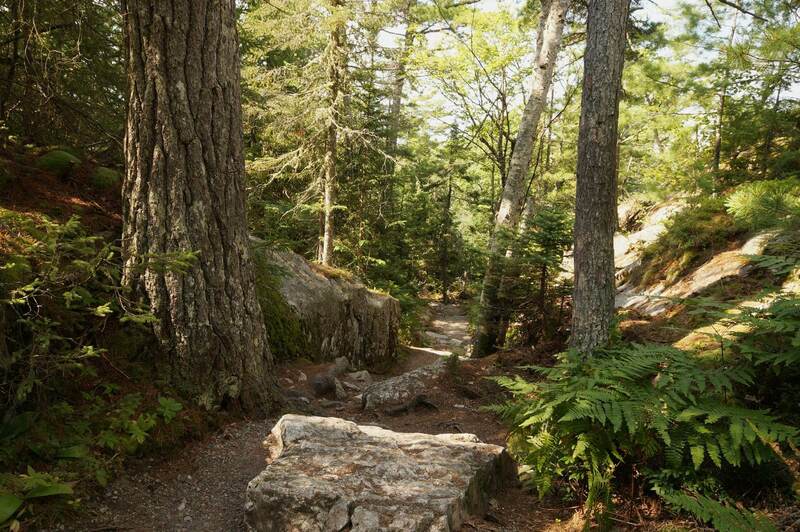 Most similar sites on the Canadian Shield are not so easily accessed and need a canoe or a boat and a bit of time to get to. 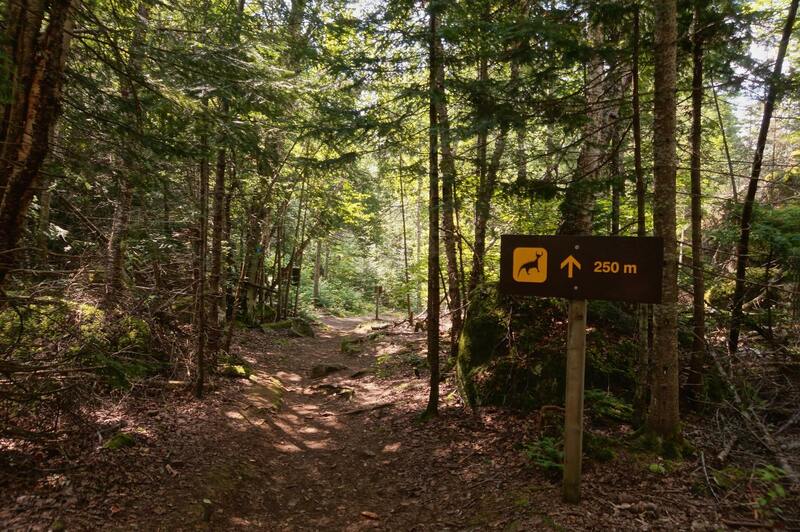 Turn off Highway 17 and on to the access road for Agawa Rock for a two-minute downhill ride to the parking lot. There you’ll need to get a machine-generated permit for $5.25 which gives you two hours on the site. 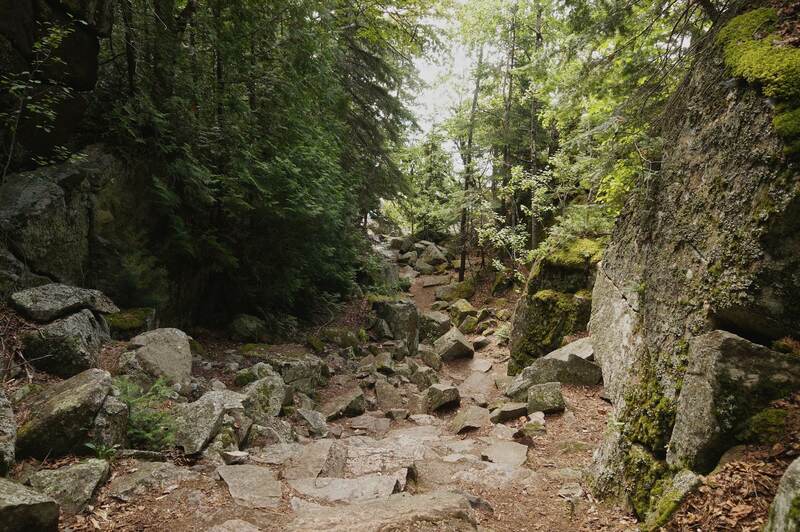 Another ten minutes of walking on a sometimes-rocky trail down to the shores of Lake Superior and you are there. There is another option if you want to paddle up to the pictographs – you can drive down to Sinclair Cove instead of turning in at the parking lot. Down at the cove is a boat launch and you can put in there. 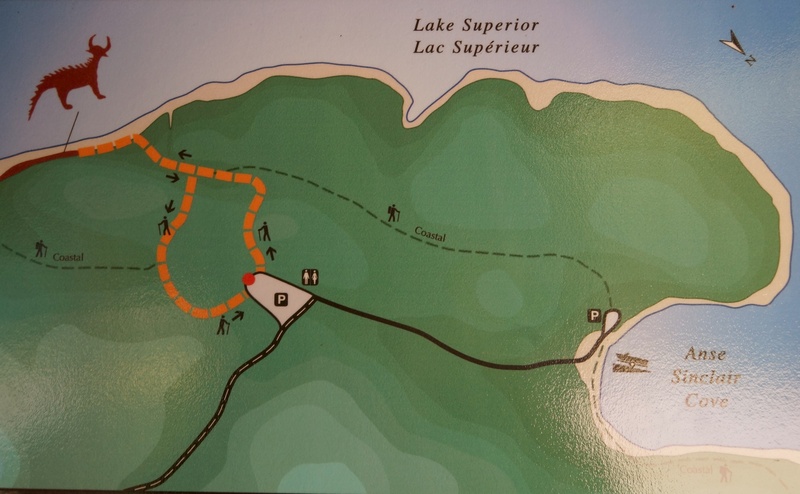 You also get to visit what was once a campsite popular with the voyageurs of old as they made their journey to the west end of the lake. If the waters are calm – which is often not the case! – the canoe option would give you a different perspective of the site as you framed some shots in your camera viewfinder. 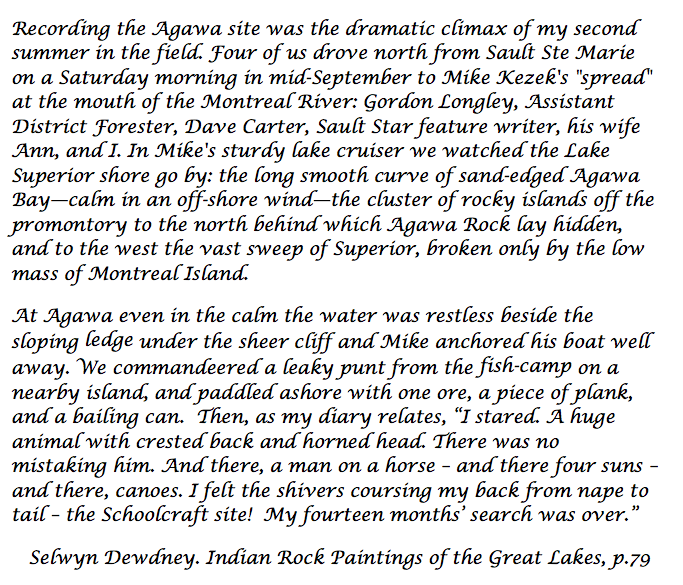 What follows is a selection of photos my brother and I took during our two visits to Agawa Rock. We first visited in August of 2013 after a Wabakimi-area canoe trip; waves and high water meant we were only able to see the first third of the site. This summer on our return from Red Lake and our Bloodvein River canoe trip we had better luck and were able to walk the length of the ledge accessible to the public. 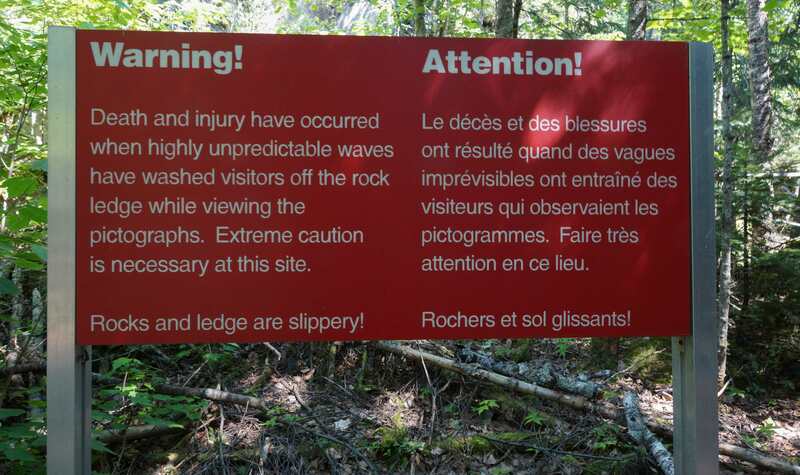 At a couple of places on the side of the trail to the pictographs, you’ll see the sign like the one below. The warning should be taken seriously – a walk on the ledge in rough weather is no place for even the most sure-footed adventurer to be. A pic a bit further below shows what it was like on our first visit – i.e. mostly inaccessible. On our second visit, we had better luck as the water in the above image shows. 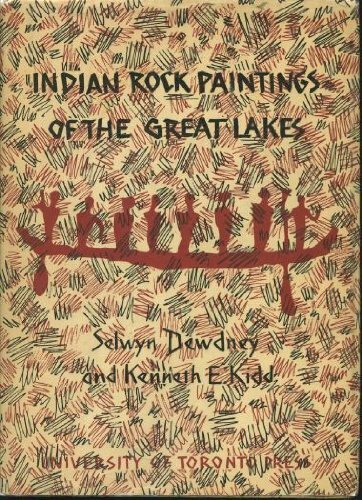 While the site was obviously known to the Ojibwe and cottagers of the area, it was Selwyn Dewdney whose inclusion of the site in his book Indian Rock Paintings of the Great Lakes brought the pictographs back into the discussion of Anishinaabe culture and spirituality. 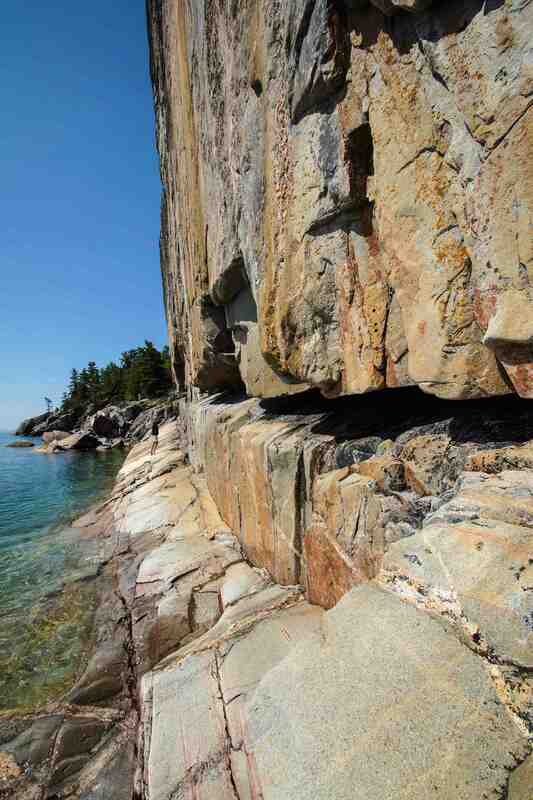 The rock ledge runs along the length of the 100-foot high granite cliffs here; you can imagine the original painters standing there and putting their ochre/fish oil “paint” to the rock face. Motivated by vision quests or the placating of turbulent spirits of the lake, a succession of painters all left their mark. 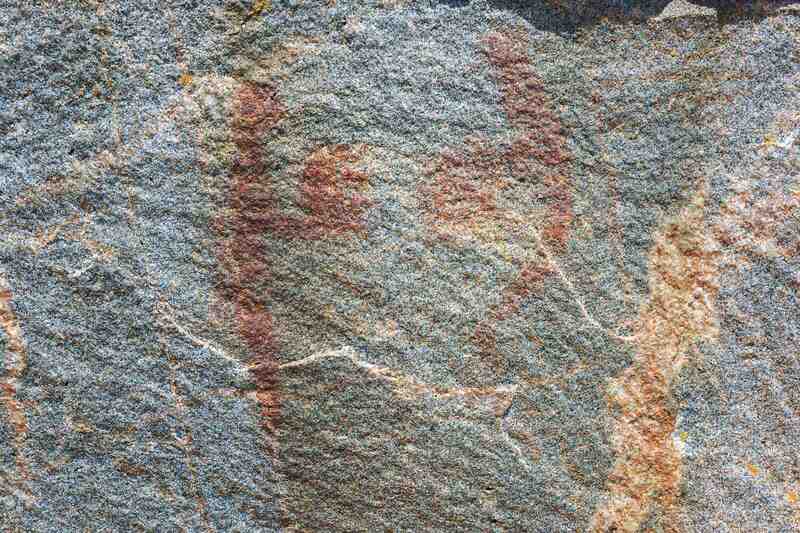 It was not uncommon for one generation’s pictographs to be painted over by following generations. 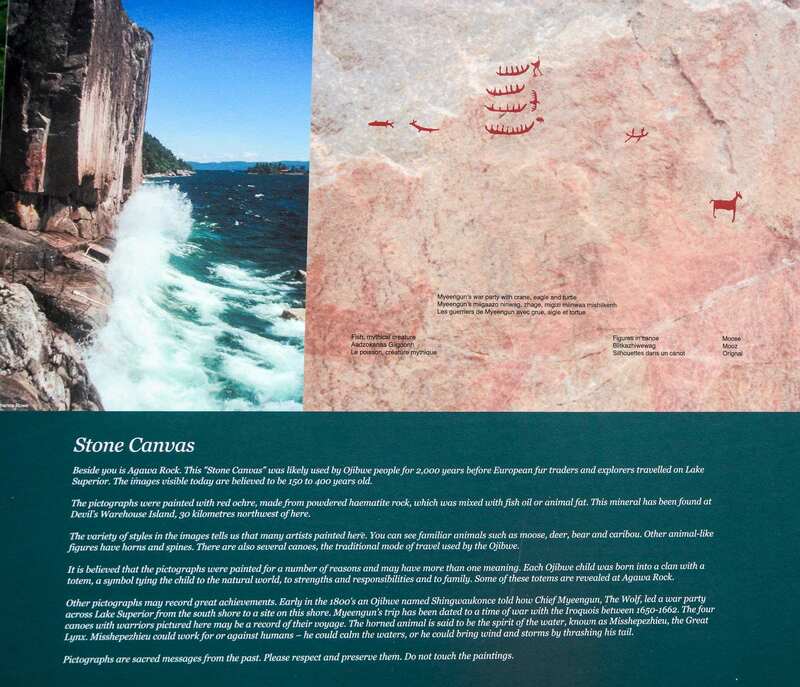 Spirits On Stone (the 2010 edition of a book first published in 1991) presents the pictographs in the voice of the descendants of the Ojibwe who painted them. 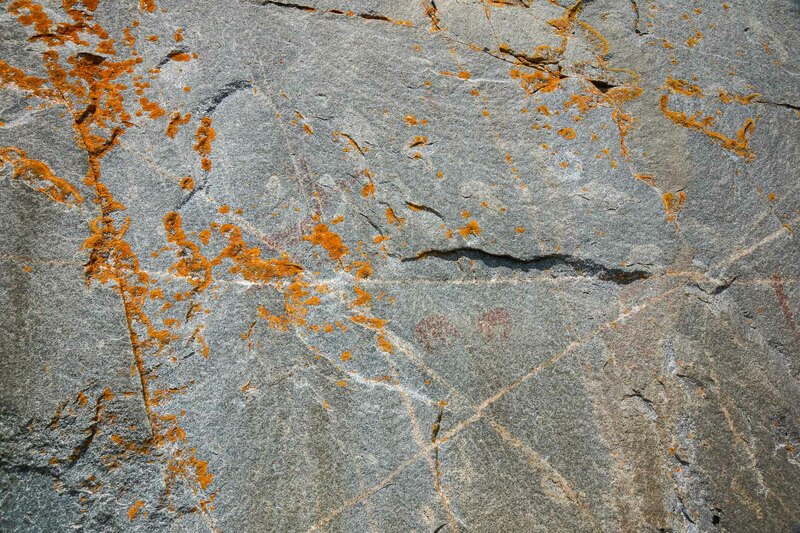 Conway identifies 117 separate pictographs at the site and provides the most informed commentary I have found anywhere as to the meaning and purpose of these rock paintings. Conway divides the site up into seventeen different panels, with anywhere from one to eight separate pictographs in each of those panels. I have used his panel numbering system (from I to XVII in Roman numerals) to identify the pictographs we recorded. Panel I is the first panel you see as you step on to the ledge. The horned snake is associated in Anishinaabe cosmology with the healing powers of the shaman or medicine man. This panel, attributed to an Ojibwe warrior named Myeengun (“Wolf”), apparently depicts a historical event from the late 1600’s. It recounts the confrontation of the Anishinaabe of the area with an invading Iroquois war party. 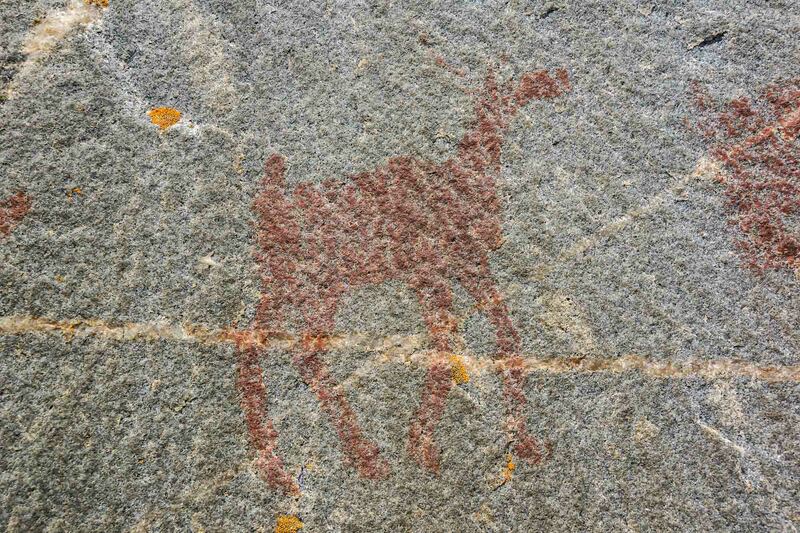 Most of the pictographs are fairly small (from 5 to 15 centimetres in size) and many are all but indecipherable. Some visitors to the site are clearly disappointed with what they see. The site is definitely not the Lascaux Caves! It is a situation where some pre-visit research can help provide the background needed to bring out the meaning of what often needs to be drawn out of the rock. The most famous panel is Panel VIII – that of the Great Lynx or Panther (but looking awfully reptilian) whose moods account for the turbulence of the lake. Canoes will make safe passage – or not – depending on whether or not he has been properly acknowledged and placated. Living with him in the depths of the Gichi Gami (“Great Sea”) are serpents, two of which are depicted below Mishipeshu. One can only hope that the canoe behind Mishipeshu did not incur his wrath. 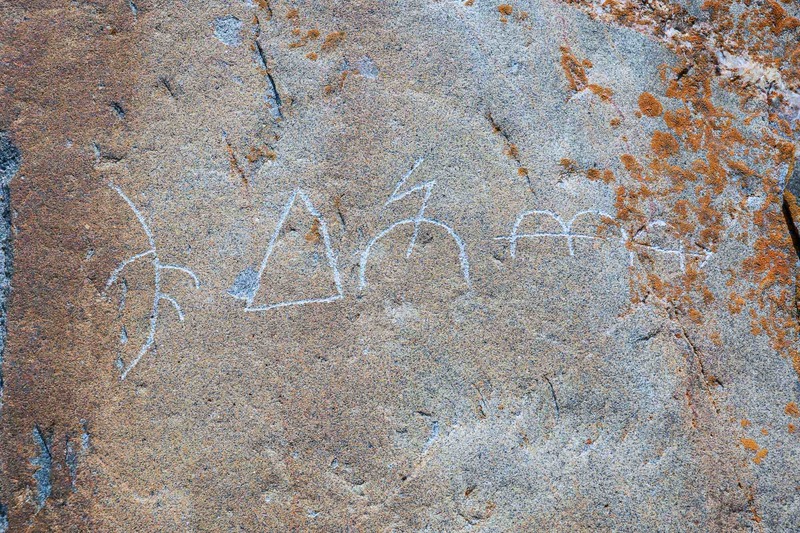 In his book, Dewdney mentions his shock on seeing that some vandal had painted his initials and the date over the Mishipeshu pictograph panel. Further research led him to the offender – the teenage daughter of a fisherman who had in 1937 painted over what Conway calls the most famous aboriginal painting in Canada. The modern paint has clearly not lasted as there is only a little evidence in 2014 of the black paint used. However, I’d sadly find evidence that even today (imagine!) there are unthinking people who are indifferent or oblivious to the impact of their actions. 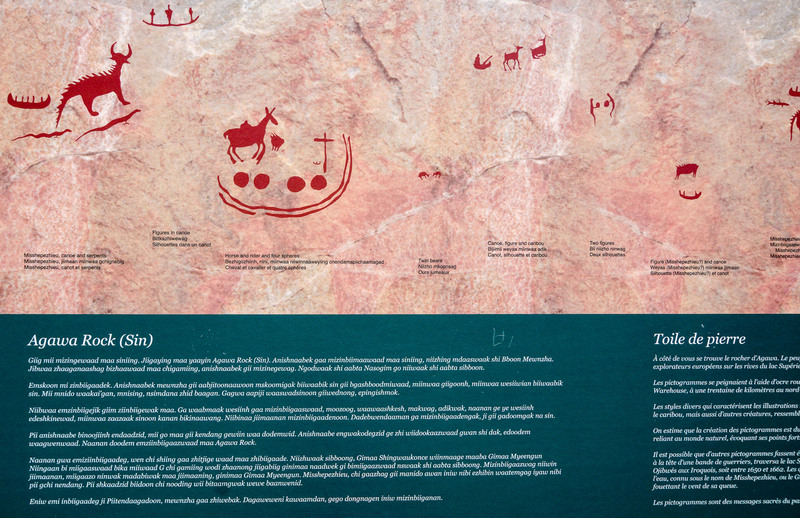 Panel X – the Horse and Rider Panel – is another dramatic set of pictographs. Seeing Conway’s rice paper copy of this panel which he made in the late 1980’s, I am struck by the degree to which they have faded. No longer visible is the cross above the fourth sphere; gone too is the louse in front of the horse. The human figure on the back of the horse is also much less clear than it was twenty-five years ago. Apparently, the two arches at the bottom of the panel were once two concentric circles which encompassed the entire panel; the top part has flaked off in time and fallen into the lake. To the right of the panel are five horizontal lines, the meaning of which we will never really know. As for the spheres, there are a couple of explanations. One has to do with the passage of time – a period of four days – to accomplish some unstated deed. Schoolcraft gives such an explanation. The interpretation port forward by Conway related the spheres to the Midewewin, the Anishinaabe society of shamans. With each sphere representing a level of power, the fourth level is the highest level of spiritual power attainable. Conway’s book, chapter 10 (“Secrets of The Horse and Rider Panel”), provides thought-provoking analysis. Barely visible these days is the cross whose base begins at the top of the fourth sphere and the canoe with a solitary paddler about a halfway up on the left side. 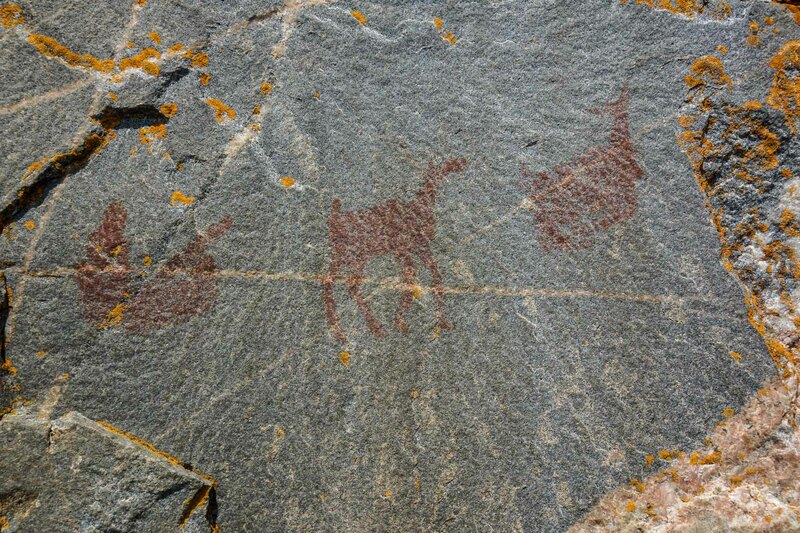 Further down the cliff face, you come across the following panel – a canoe with a human figure in it followed by two caribou. 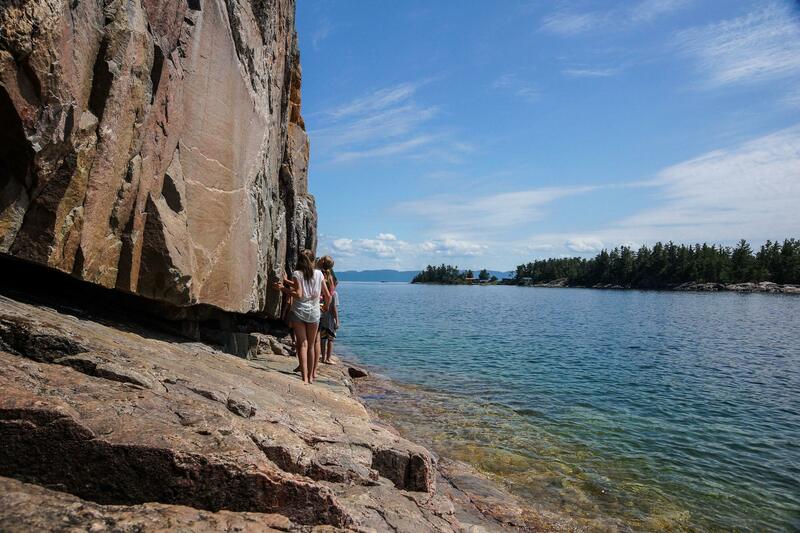 And that was it for our visit to the dramatic cliff face of Agawa Rock. 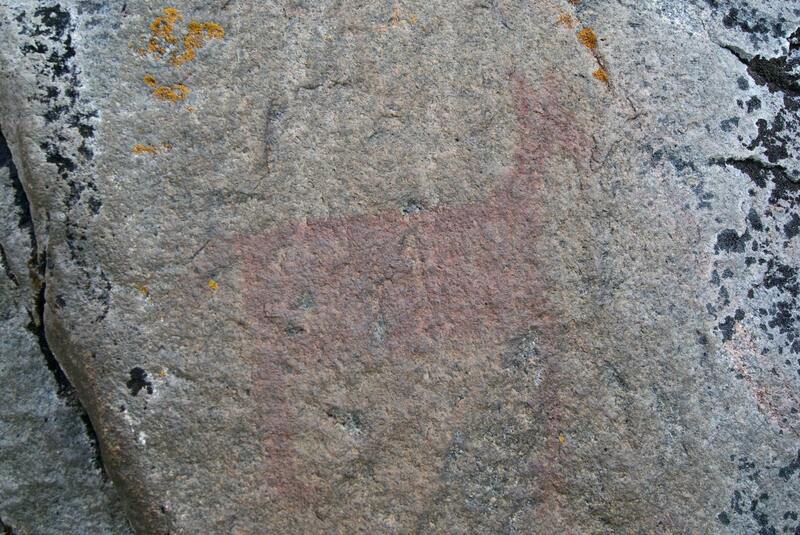 There are a few other pictographs just a bit further but they are beyond public access. We turned around and headed back for last looks at the two bears, the horse and rider, the Mishipeshu and snakes. 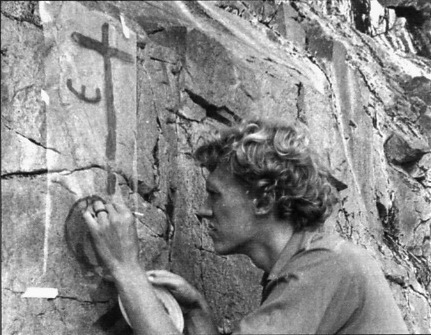 We also got to look at a couple of examples of recent acts of vandalism – the older painted initials in the image below and, very troubling, the new nonsense symbols scratched into the rock face with a key or some sharp object. It seemed very fresh, perhaps from 2014. Usually, there is a park employee sitting at the beginning of the pictographs; sometimes though (s)he goes up to the parking lot to check for possible non-payment by visitors. In any case, there is no way to police the entire rock face 24/7. My school teacher’s answer is to make people aware of the significance of what they are looking at and of the impact of their actions to the point that they police themselves. 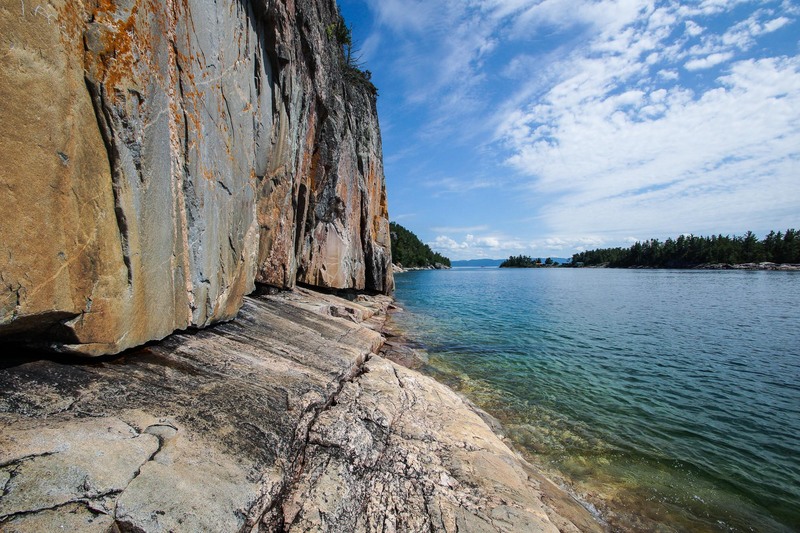 That, of course, is the theory – but damn, just look at this piece of ignorance…it is not the first bit of graffiti that Agawa Rock has seen but it is so fresh you can feel the scratches and they hurt. “the lake that they call Gitchi Gami”! 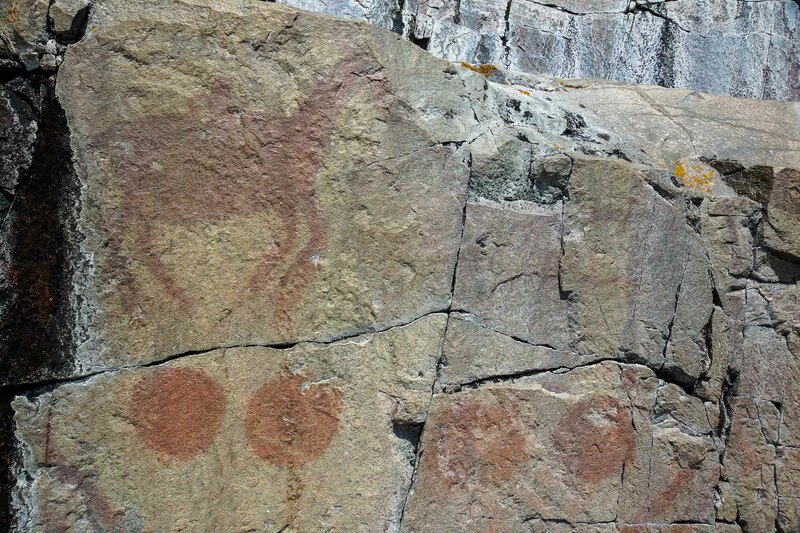 Recommended before or after a visit to the site is some time spent checking out these three classics of Ojibwe rock painting research in Canada. Just click on the title for access to the book itself – or for info on how to get it. 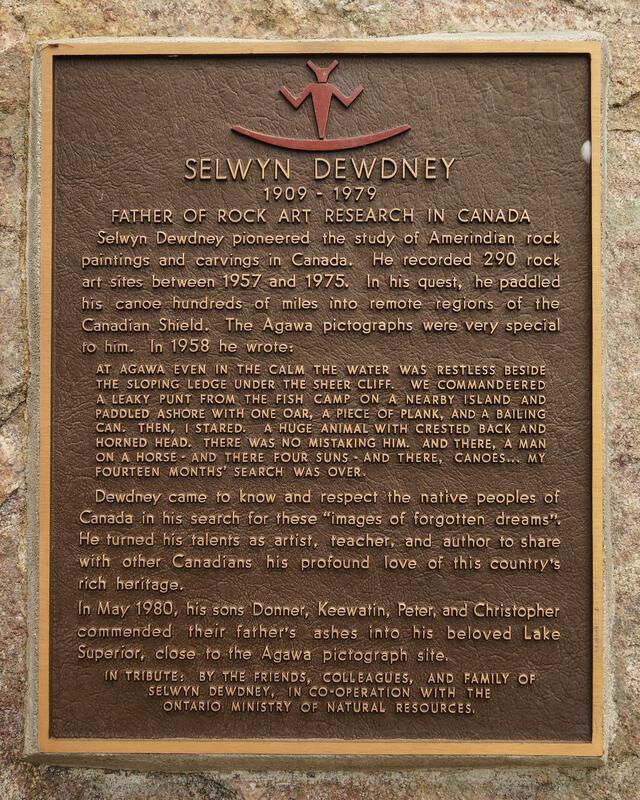 Selwyn Dewdney. 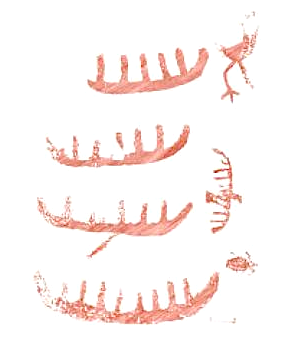 Indian Rock Paintings of the Great Lakes, especially p, 77-83. Thor Conway. 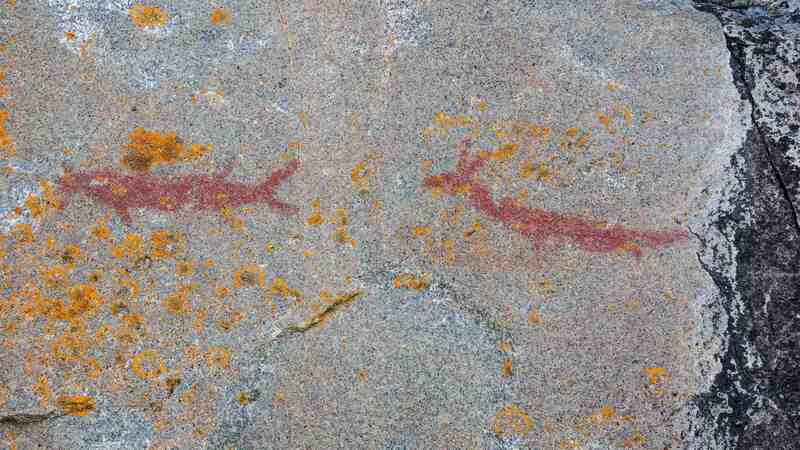 Spirits On Stone: Lake Superior Ojibwa History, Legends & the Agawa Pictographs. 2010. Second Edition. 132 pages. 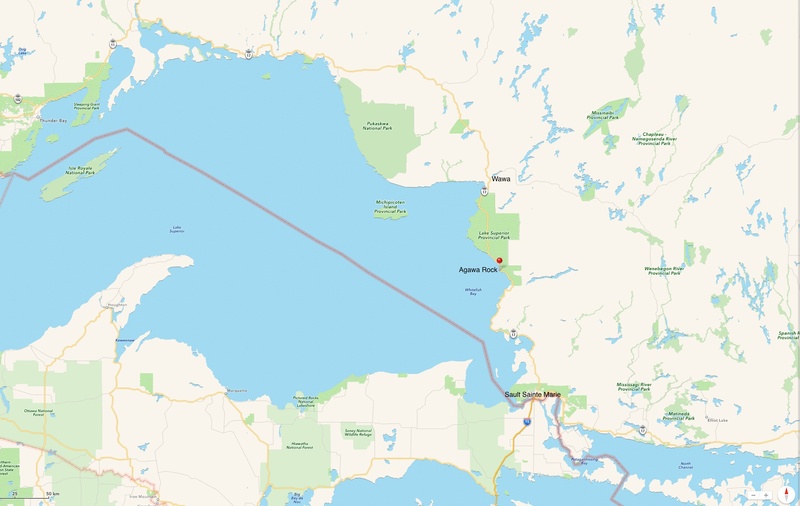 While I ordered my copy directly from the author, I also did see a half-dozen copies of the book available at the Lake Superior Provincial Park interpretative centre a few kilometres south of the site at Agawa Bay. The first edition of the book (1991) is the one shown at the Amazon website. You definitely want the second edition with all the additional material! Grace Rajnovitch. Reading Rock Art. 1994. Seven of the 143 figures and illustrations in this book are from Agawa Rock, which also gets frequent mention in the text. 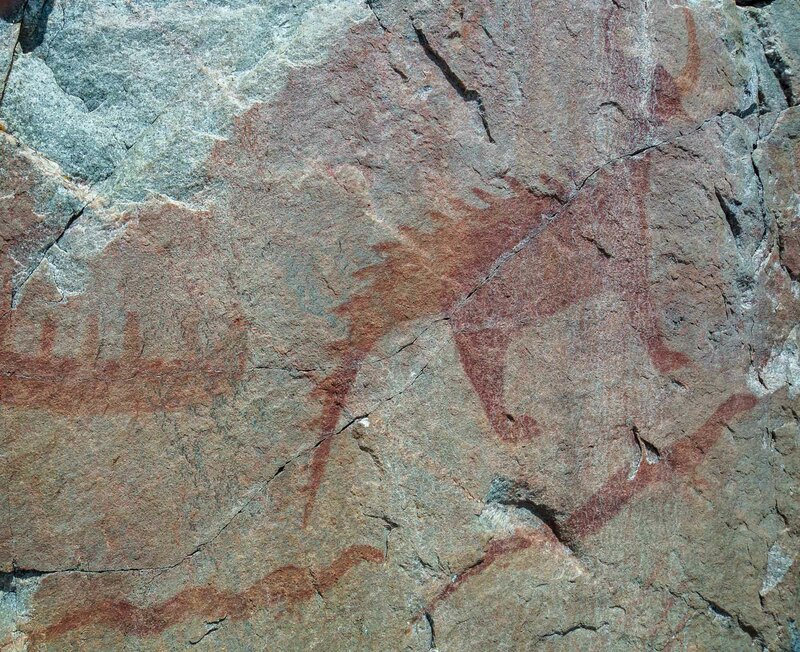 The book is recommended to anyone keen on understanding more deeply the Anishinaabe culture behind the pictographs. 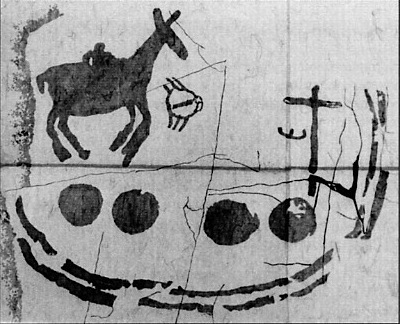 Rajnovitch makes major use of the illustrations and text of the Ojibwe birchbark scrolls in her bid to “read” the rock art. 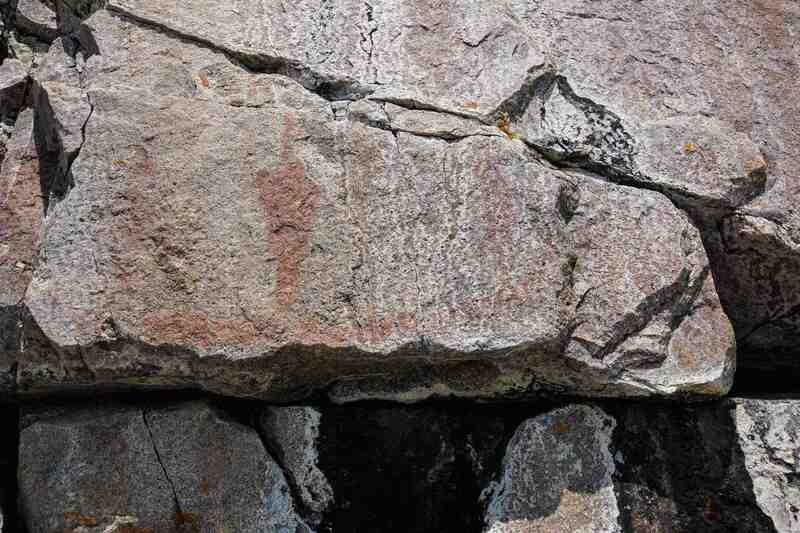 The Lake Superior Provincial Park web page specifically dealing with the pictographs of Agawa Rock can be found here. 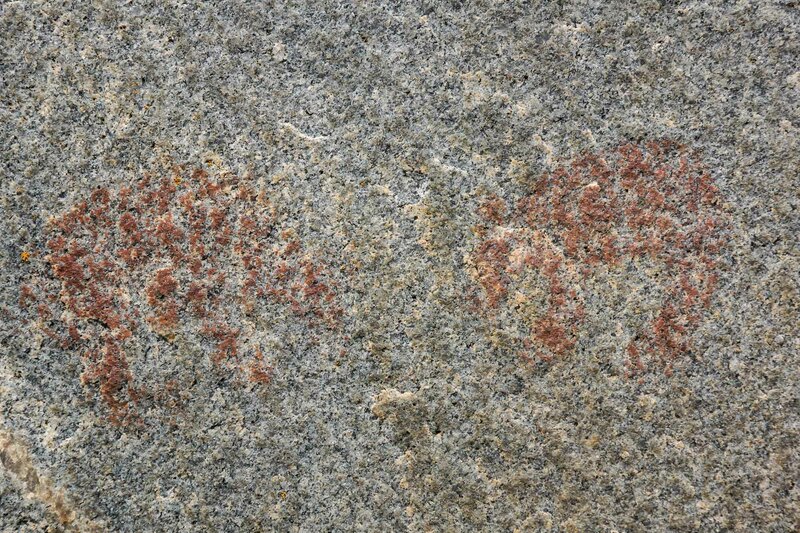 If you’d like more information about other native rock painting sites, the folder “Anishinaabe Rock Art” in the header has a long list, including these two to get you started! 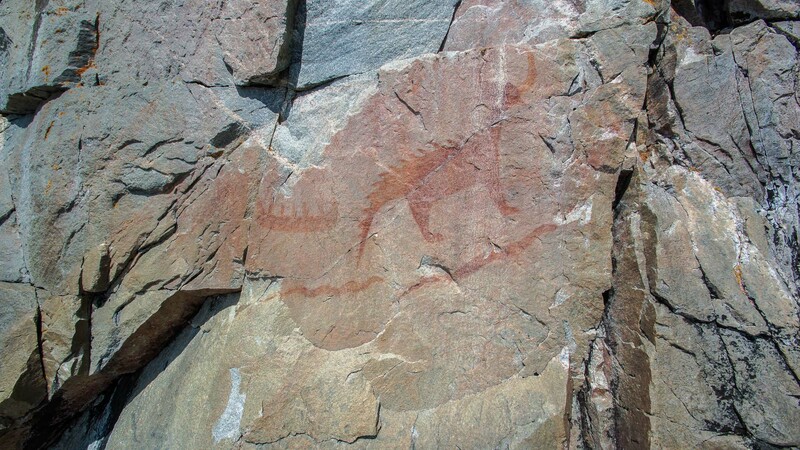 This entry was posted in Pictographs of the Canadian Shield and tagged agawa rock graffiti, Agawa Rock Paintings, Anishinaabeg art, bear pictographs, Dewdney agawa rock, Mishipeshu agawa, schoolcraft agawa rock, Wolf's War Party pictographs. Bookmark the permalink. I wonder what they used for paint. 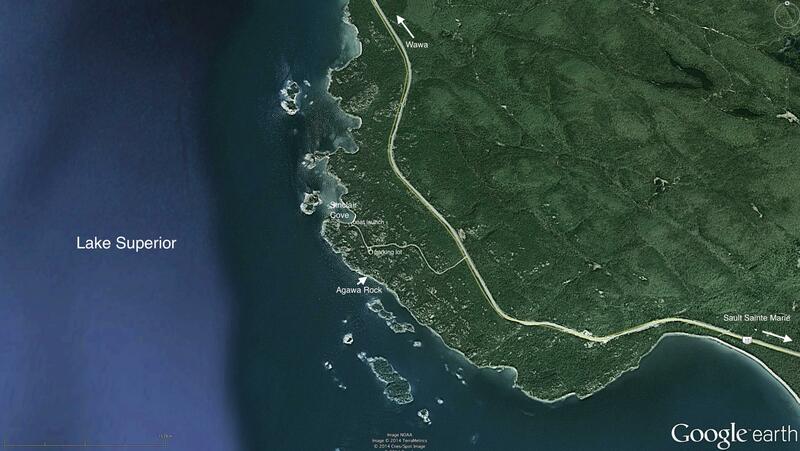 Also, how has it lasted by the water (agawa rock) for so long, and why has it faded so much in the last 25 years? 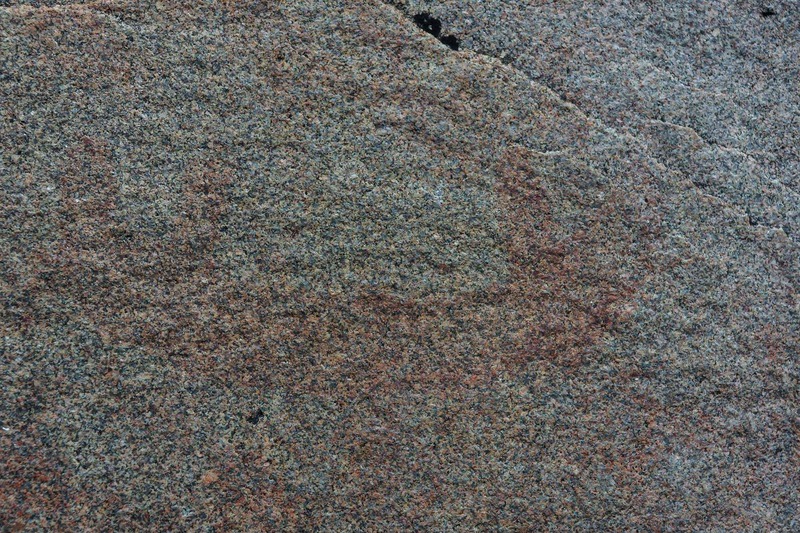 The “paint” used by the Ojibwe shamans to put their images onto the white granite rock face was called “onamin” or “wunnamin”. This substance was a mixture of at least two ingredients. First, they turned pieces of ochre-coloured hematite or ferric oxide into a fine powder. Then they mixed it with fish (often sturgeon) glue and oil. This was the paint they used. An explanation from myth that I recall imperfectly from my reading is one I saw in Norval Morrisseau’s Legends of My People The Great Ojibway. He tells of an epic struggle between Nanabush and a Giant Beaver who had constructed a dam blocking the water from leaving Lake Superior (Gitchi Gami). In the end the beaver was killed and his blood sprinkled all over the area. 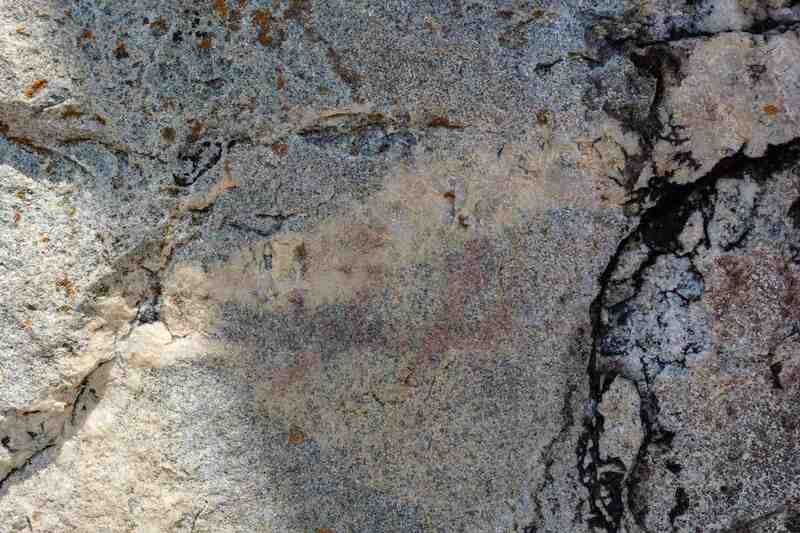 It is this blood that shamans use to draw the images on the appropriate rock faces. 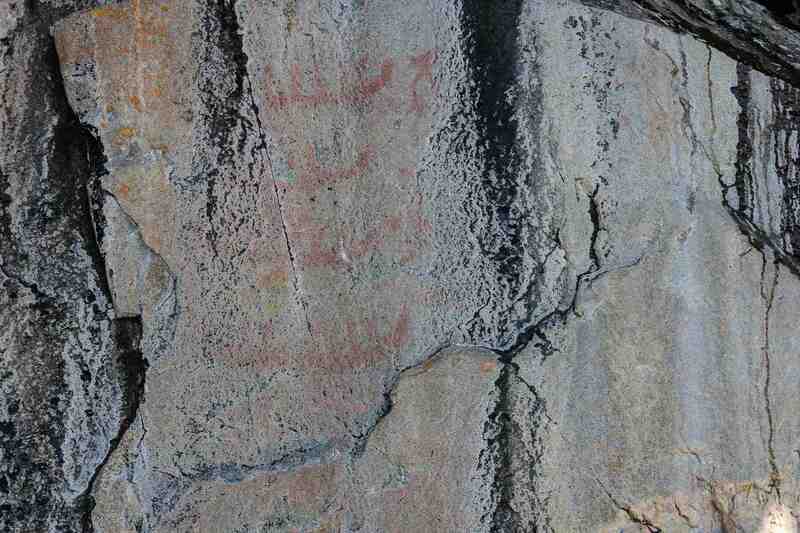 A safe guess is that the pictographs that are still discernible were painted between 150 and 500 years ago. The evidence does not support claims that the ones we can see date back 5000 years or 2000 years. 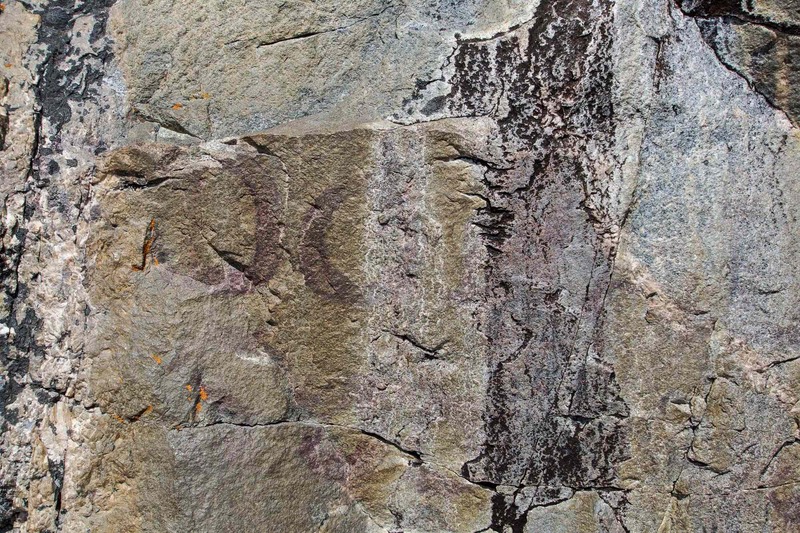 This does not mean that pictographs were not part of some cultural tradition way back then; it just means that those images have faded away, perhaps to be painted over by newer images. 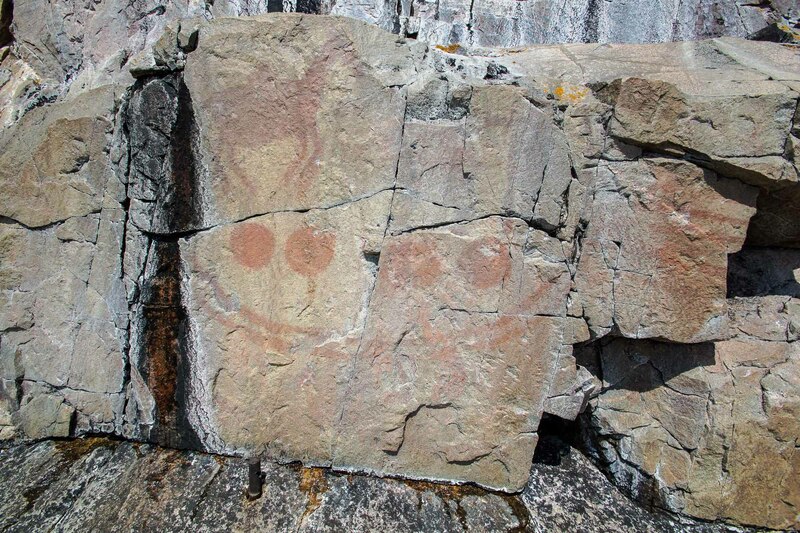 It is entirely likely that all the pictographs I have seen in my paddles will be gone in fifty or a hundred years. you’re right about the noticeable change just in 25 years. 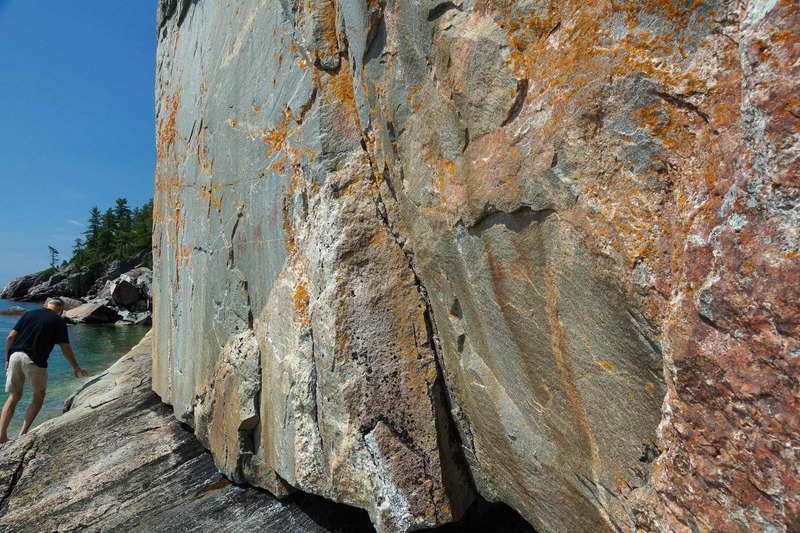 The fading and blurring – not to mention the breaking off from the rock face of entire slabs of the rock as I saw at the major site on Artery lake this summer – like all things in this world, they have a limited shelf life. 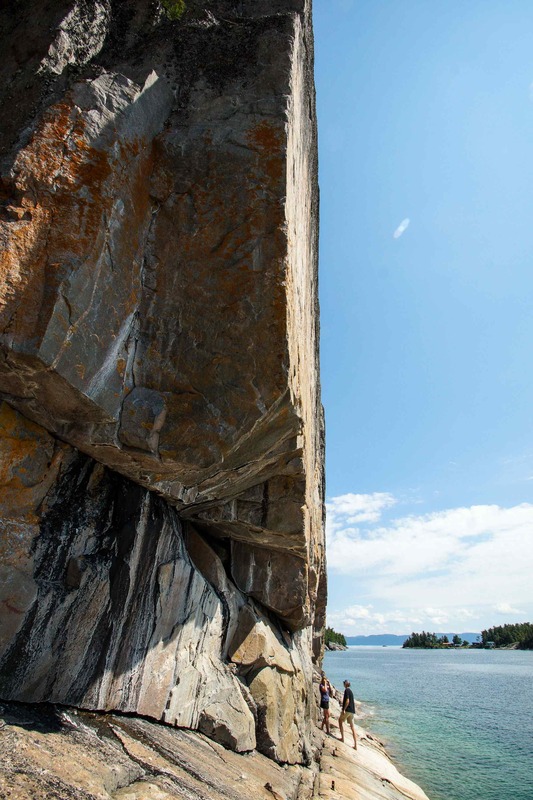 Agawa Rock is a special place. I’m glad my post captured a little of that. Some day I hope to visit and see these pictures. What a fantastic find. I live for evidence like that, of people’s dreams and ideas long ago, living in a time I also dream about. Hopefully you can mount some sort of camera, or at least a sign on the paths saying there’s a hidden solar-powered camera on the pictograph area catching any who molest it which will lead to a huge fine. 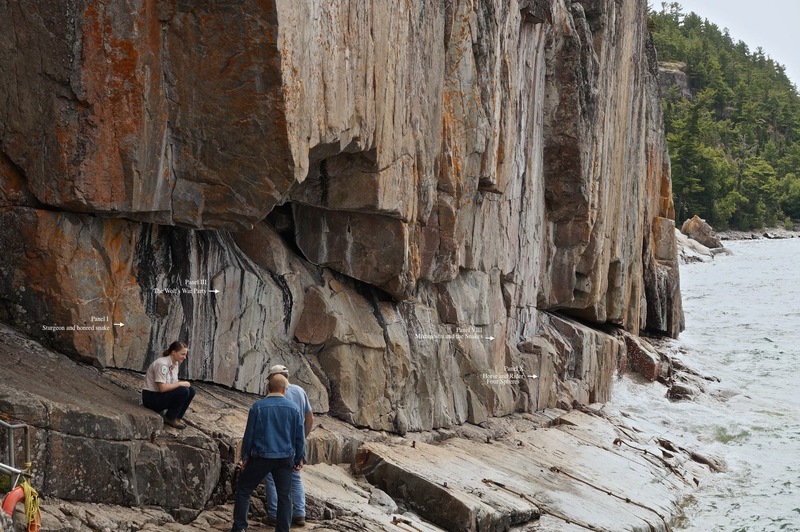 Thank you for compiling all of this wonderful data and photos of the Agawa Rock! I recently visited a few weeks ago and was thrilled to see Mishepeshu again! He also makes an appearance on the Sanilac Petroglyphs here in my home state of Michigan. 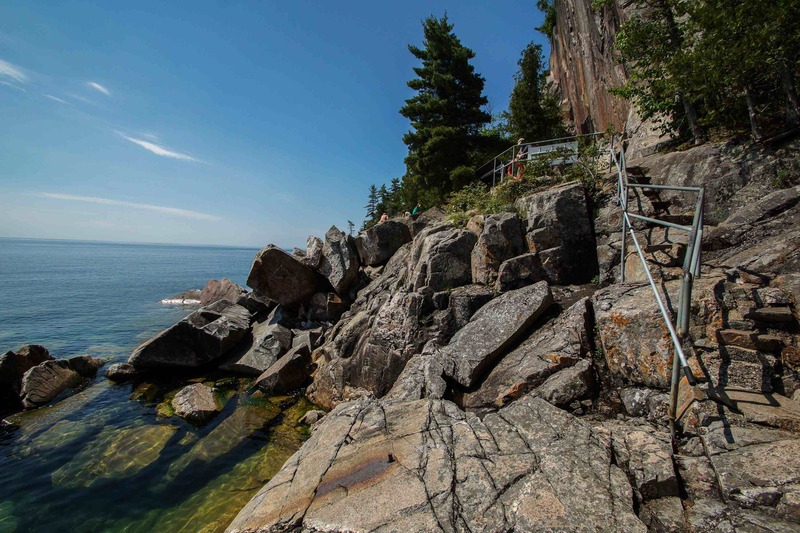 Even though I have only visited this area of Canada twice before in my life this was my first visit to Agawa Rock, and the whole trip felt as if I had come back “home” for a visit. Alison, there are more than a few pictographs sites on the U.S. side that I’d love to get to! So much to discover! Tyra – you’ve picked my two favourite areas of study – human culture and Mother Earth! When I was 18 (back in 1969!) I started my work on a degree in World Religions – I could easily have picked anthro as my field of study! And on my canoe trips I find myself wishing that I had picked geology so that I could read better the story of the rocks and landforms I am paddling by. Reading books, reading people, reading rocks! A geologist is just practising a different kind of literacy! 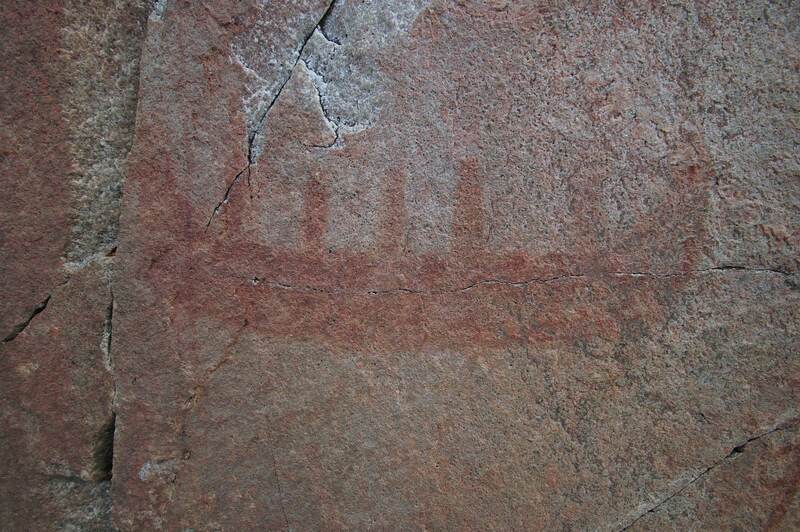 As for the pictographs, they need a new generation of Anishinaabe and others to care for and about them. A miigwetch back to you for your positive review of my post! May your studies take you on a great journey!